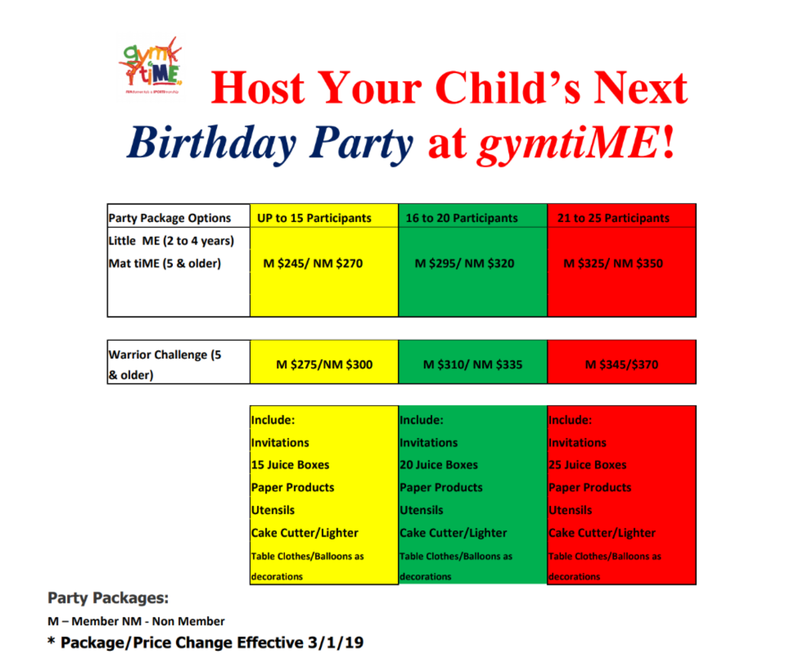 Host Your Child’s Next BIRTHDAY PARTY at gymtiME! OUR GYMTIME PARTIES MEAN NO MESS FOR YOU! EMAIL us @ mailto:gymtimebdayparty@gmail.com to RESERVE YOUR PARTY TODAY!! Our little ME Birthday party is designed for children ages 2 to 4 years old. Two of our very qualified lead instructors will lead you, your child and your friends through 1 hour of activities in our TWO gymnastic rooms! Songs, games, parachutes and bubbles are just a few extra activities added between fun and exciting obstacle courses! Our MAT tiME Birthday party is designed for children ages 5 years & older. Two of our very qualified instructors will lead your child and friends through 1 hour of activities in our TWO gymnastic rooms! Our Lead instructor will design an age appropriate gymnastic based obstacle course and skills to be introduced and incorporated throughout the party. Additional games and activities are included to bring some extra fun to the hour! Our gym tiME Warrior Challenge Birthday party is designed for children ages 6 to 12 years old. Two of our very qualified lead instructors will lead you and your friends through an AWESOME OBSTACLE COURSE fit for WARRIORS! Both rooms will be filled with approx. 10 obstacles each to test your strength and endurance. Team Competitions are added to demonstrate your teamwork. The question is??? ARE you TOUGH enough to complete the gym tiME WARRIOR CHALLENGE!!!! TWO teams will battle! Don’t worry the birthday child will get to battle all your awesome guest. What Does Your Child and Guests Get? 90 minute party hosted by an experienced Gym tiME instructor/hostess from the beginning to the end. No clean-up for you… We do ALL the work. A Special Surprise for the Birthday Child! Looking for an alternative to cake?? Look no further! We have teamed up with a local business “Just a Dream” to offer a frozen yogurt table. An additional 2 flavors (equal 4 ) or extra 9 toppings (equal 18) can be added for a additional fee. A non-refundable $50 Deposit and Completed Party Agreement is REQUIRED to finalize and book your party. Host Family/Guests may NOT have access to Party Room more then 15 minutes PRIOR to your scheduled Party Start time. Prompt departure is required. Parties going past the scheduled 90 minutes will be charged an extra fee. All guests of gym tiME will respect the facility and staff. At anytime our staff feels that the level of respect towards our facility or themselves is not acceptable they have all right to stop the party. NO refunds will be provided, payment in FULL is required. Remaining Balance is DUE in FULL the day of the party.